When I first visited Brome back in the 1990s, this church had been a rather run-down and most often inaccessible building. 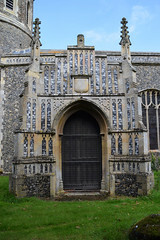 But in the following decade there was a massive programme of restoration at St Mary, coupled with what felt like a reawakening of the Church in this part of Suffolk. 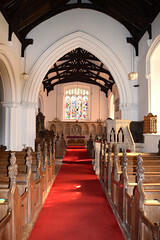 The church is in excellent condition now, and open every day. 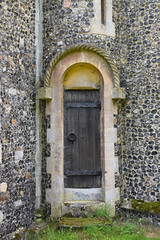 Brome, pronounced broom, sits just to the north of the pretty little town of Eye, and St Mary is essentially a Victorian rebuilding of an early medieval church. It must be said that it was somewhat unappreciated by the church explorers of the last century. How times have changed, especially with regard to our understanding and appreciation of what the Victorians did! 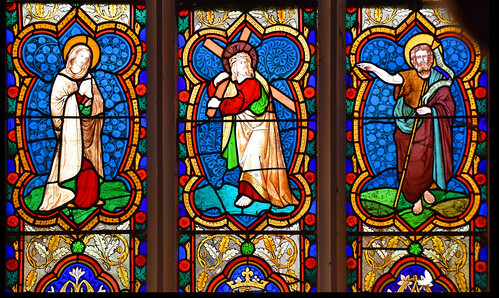 For the church here is the work of none other than Thomas Jekyll, now recognised as one of the most innovative designers of the Victorian era. Jekyll almost completely rebuilt St Mary between the 1850s and the 1870s, and it would seem that little expense was spared. 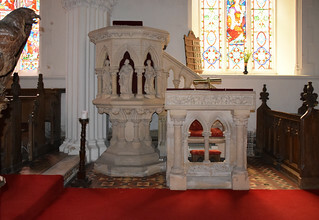 All that survives from the earlier church is the lower part of the tower, the font now beneath it, and a magnificent late medieval south porch which now acts as a vestry. 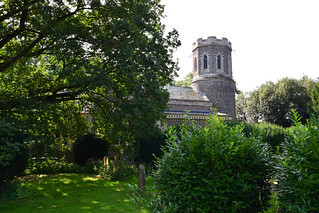 This is easily missed, as the only view of the church is from the south, and you need to go around the tight churchyard to see it. 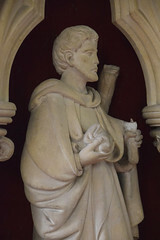 Jekyll's work was augmented by the largest known collection of the work of the Ipswich sculptor James Williams, whose workshop produced the long stone reredos, altar rails, prayer desk and now sadly battered pulpit. The project was bankrolled by two millionaires. 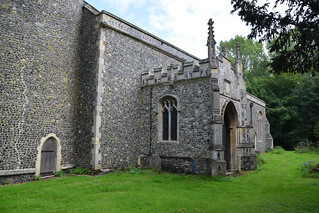 One was Lord Kerrison, whose name is inescapable in this part of Suffolk, and the other was the Rector here for forty years, George John Mapletoft Paterson. 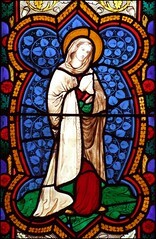 Best of all, the church has one of the best collections in all England of the stained glass work of the great Robert Bayne, part of the Heaton, Butler & Bayne partnership. 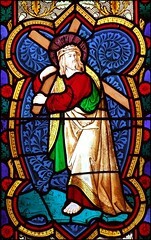 To start in the east, the great window is Bayne's sumptuous depiction of the Last Judgement, a rather unusual choice of subject at the time perhaps. 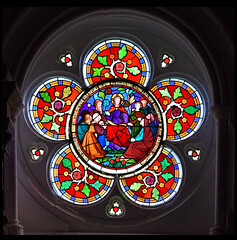 Christ sits holding his orb near the top, flanked by Disciples laying down their crowns, and angels holding open the books of judgement. 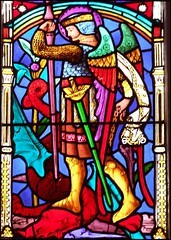 Below, there are two images of St Michael, one of Mercy, showing him with his sword killing a dragon, and one of Justice, showing him with his scales. On the left, a smiling angel ushers the saved into Heaven. 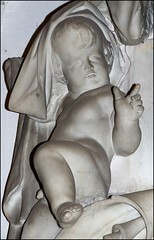 On the right, a frowning angel directs the damned into the mouth of hell. The intense colours of Bayne's design must have made quite an impression in those days before electricity, colour photography and the like. You can't help thinking that it would have had a rather sobering effect upon the 19th Century farmworker nursing his Saturday night hangover through the Reverend Paterson's sermons. 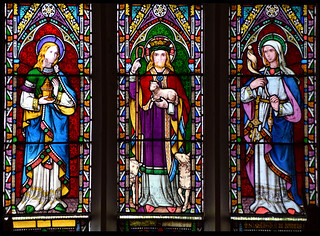 Apart from the window depicting Christ the Good Shepherd flanked by Mary Magdalene and Martha in the north transept, which appears to be by William Wailes, almost all the rest of the glass in the church is by Heaton, Butler & Bayne, except for the curious window on the south side of the sanctuary, which is said to have been designed by Lady Kerrison. 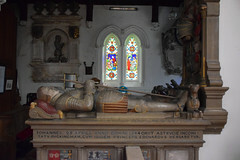 But even if you have no interest in Robert Bayne's glass, you will want to come here to see the Cornwallis tombs. 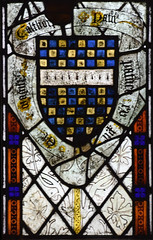 The Cornwallis family was one of the most powerful in East Anglia towards the end of the medieval period, having no doubt taken full advantage of the way in which the old feudal order came to an end as a consequence of the Black Death. 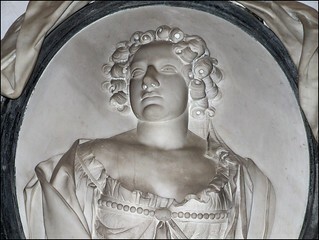 Thomas Cornwallis was Comptroller of the Royal Household under Mary I, and was held in such high regard that Elizabeth I asked him to stay on to help oversee her cultural revolution. 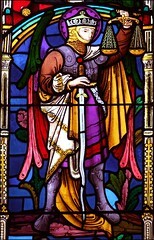 He is said to have replied that he was perfectly happy with the religion he already had, which was the religion of his ancestors, and had served them well. 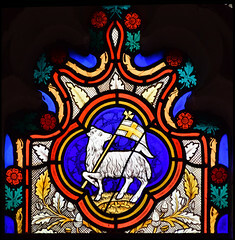 Instead, he retired to Brome to raise sheep, and pay the occasional extortionate fine imposed by the local Anglican jobsworths. 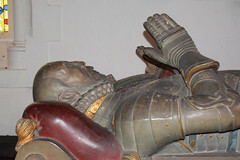 He survived Elizabeth by a year, and died in 1604 at a time when many memorials reflect the Puritan temper of the time. 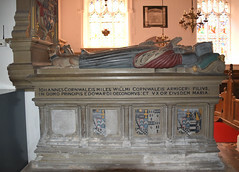 However, Cornwallis's father Sir John Cornwallis, who had died as long ago as the reign of Henry VIII, lies with his wife on a glorious late medieval tombchest, and Thomas's tomb is a near copy of it. 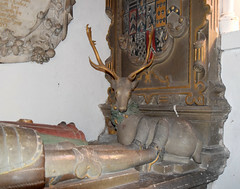 Other Cornwallises are also remembered in this corner. I was so glad that I'd come back to Brome. I wandered around the graveyard, finding the elaborate memorial to George Paterson immediately to the east of the church. Thomas Jekyll would eventually go mad and die in a lunatic asylum, but not before pioneering the Chinoiserie revival in England. 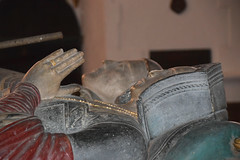 Lord Kerrison remained one of the most significant figures in Suffolk politics until his death, and his mark has been left all over the north of the county. 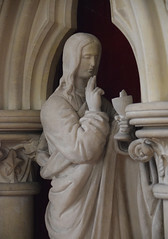 If the three of them could come back to St Mary today, they would immediately recognise it. 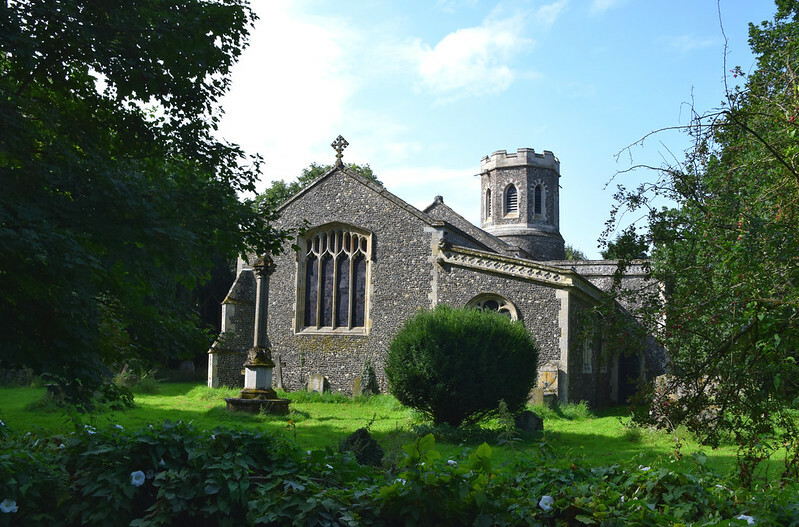 This is a wonderful church, an extraordinary labour of love, one of the finest documents in East Anglia of the piety, energy and wealth of mid-Victorian Anglicanism.